The "I CHOOSE YOU!" Adoption Event is this weekend at the Maryland SPCA. In addition to having multiple Poke-stops on our campus, we also have an abundance of adoptable pets! This weekend we will be waiving adoption fees for adult pets when you say the code-word "Pokemon". Our hours for adoption on Saturday and Sunday are from 11:00 a.m. - 4:00 p.m. Pet visiting hours end 15 minutes prior to close. 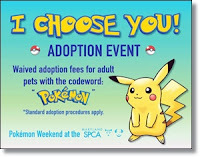 Standard adoption procedures apply including the $20 pet ID Package. The package includes a microchip, engraved name tag, Baltimore City License, and collar.